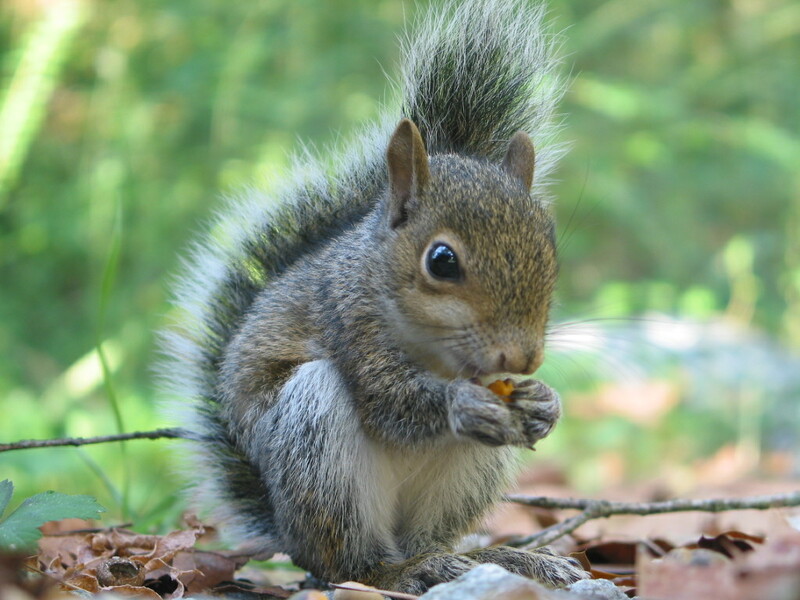 The common squirrel... Nature's little saver, or beast of the devil? I contend that it is the later, and here is why. First, I need to say that this is coming from my (Aaron's) perspective. The opinions in this post, while widely accepted and known to be fact, may not represent the opinions of my wife, dear, sweet, Melissa. Now that that's out of the way, on to the saga. For those of you who don't know already, Melissa and I purchased our first home back in November of last year. It was an exciting time in our lives, one we looked forward to with great anticipation. We got all moved in and settled and life began to take on an air of normalcy. That is until the day we heard a noise. The noise we heard was coming from several locations, above the bed in our room, in the living room above the recliner, behind the fireplace, and in one of the exterior walls in the living room. My initial investigation revealed mouse-like droppings in the attic, so I began a multi-month campaign of mouse hunting with both snap and glue trap. This campaign was fruit-less however, and I began to get frustrated. As a last-ditch effort to both preserve my sanity, and rid my abode of the vermin, I took one of the glue traps and placed it gingerly in a soffit vent that is on our patio, which was very near where we had heard one of the vile creatures happily chewing away at my investment. I left the vent open for easy access since it was in my screened in patio. This proved to be both a blessing and a horror. The next day I take a phone call from my bride while at work. She proceeds to inform me that something had gotten into that glue trap and had fallen through the vent, and landed on the porch. She also informed me that the rodent that had fallen into my trap was not a mouse, but in fact was a tiny squirrel. So I left work to go home and deal with the squirrel problem. Upon my arrival, I snap this picture. Yes, it's a tiny squirrel, sitting on my patio, looking adequately freaked out. 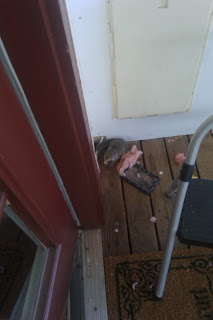 Fast forward to the next day, and while at work, I take another call from my baby-momma, informing me that there was now, not 1, but 2 squirrels on the patio. Apparently the small one had fallen through again, and, what we presume to be the parent of the small squirrel had jumped down to its aid, and they were both trapped on the patio. Well the battle is lost, the squirrels win, right? No! I am on top of the food chain here, so I automatically win... Squirrels: 2, Aaron: 1,000,000. It's been happily quite in our walls/attic as of late. So yes, I win. I really felt sad about the death of my squirrel buddy. The squirrels have been quite entertaining for me during my time on bed rest (so long as they weren't in the attic). Thankfully the "baby" squirrel seems to be doing great and he has moved to the neighbors tree. I for one feel a lot of regret and guilt about what happened to the other squirrel. I promise we did not intentionally block the squirrel under the patio (at least thats what Aaron says). Wow! Sounds like a four star drama movie at the Wagners. Can't wait for part 2.